King Charles II was crowned 350 years ago on 23 April 1661. This was at the end of England’s only republican period. 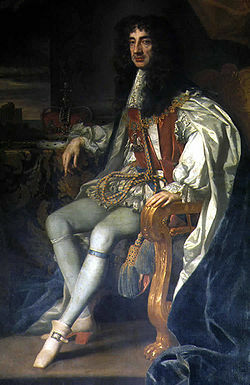 The reign of King Charles II is often called the Restoration period. He is also well-known for his love of cavalier spaniel dogs. In fact he and his father before him were both quite dotty over them. Even the style of hair worn by men at the time resembled the fluffy ears of these dogs. My King Charles Cavalier spaniel, Oscar asked me the other day that on this anniversary he would like to renounce the monarchy and embrace his republican family’s ways. From now on he will be known as a Cromwell Roundhead spaniel. This is his formal notification to the world, writes history editor Glenn Davies. Charles II (with hair like modern day King Charles Cavalier’s) as painted by Sir Peter Lely, c1675. Dogs appear to have been popular pets with British royals. Charles I took his dog with him to his execution, Richard II had a faithful greyhound that followed him everywhere, Queen Victoria’s dogs won prizes at Cruft’s dog show, and Queen Elizabeth II is well-known for her many corgi’s. Other palace pets have included Henry I’s collection of animals at Woodstock in Oxfordshire in as early as 1115, which included lions, leopards, lynxes and an African porcupine; James I’s lions which he bred; and George V’s pet parrot which he liked to take to breakfast.‘Cavaliers’ was the name for the royalists (who were rich enough to be mounted) and ‘Roundheads’ for the Parliamentarians (who had distinctive helmets). The English Civil War, which toppled King Charles I, is often characterised as a battle of ‘Cavaliers’ against ‘Roundheads’. Charles I was executed at Whitehall on 30 January 1649, at the climax of the English Civil War. England entered the period known to history as the English Interregnum, or the English Commonwealth, and the country was a de facto republic, led by Oliver Cromwell. The political crisis that followed the death of Cromwell in 1658 resulted in the restoration of the monarchy, and Charles was invited to return to Britain. The ‘Restoration’ of the English monarchy occurred on 23 April 1661. This was also the time when King Charles Cavalier dogs were also ‘restored’ to prominence. Toy Spaniels became popular as pets during the Renaissance period, especially among European nobility and royal families. These dogs were used to attract fleas away from humans and as a way to cure stress ailments and prevent forms of stomach illnesses. In England, these dogs were sometimes called the ‘Spaniel Gentle’ or ‘Comforter’ and were preferred by ladies as pets to help stay warm in cold drafty castles and manors, as well as in carriage rides during the winter months.This spaniel was given the name ‘King Charles’ after King Charles II who had favoured the breed since his youth when he was often seen with several of these dogs. The first King Charles Cavalier spaniels were recorded in paintings from the 16th, 17th and 18th centuries as small dogs that were regularly found in the houses of royalty and in court. King Charles I kept a spaniel named ‘Rogue’ while residing at Carisbrooke Castle. In 1637, Sir Anthony van Dyck painted ‘The children of Charles I of England’. 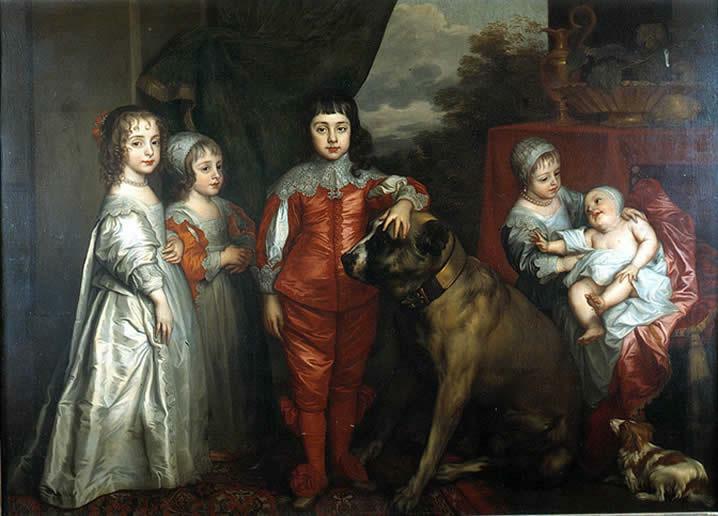 The painting, now held in the National Portrait Gallery, London, is of the five children of King Charles I of England, including the future Charles II of England. From the left, they are Mary, James, Charles, Elizabeth, and Anne. 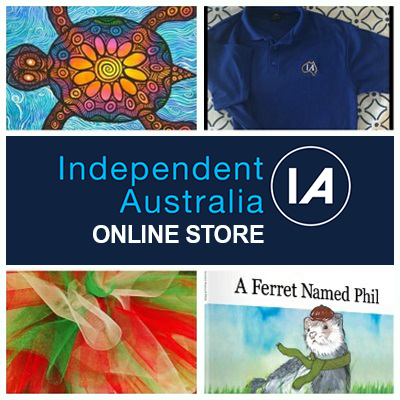 In the bottom right corner can be seen a Blenheim King Charles Cavalier spaniel, a favourite childhood pet. It was said of him that "His Majesty was seldom seen without his little dogs". Charles II loved this breed so much that he wrote a regulation stating these spaniel dogs were to be allowed in any public place together with Parliament. That law still exists today. During the 1700s and 1800s, the original breed of King Charles Cavalier spaniels were bred out. At some point during the 1800s the original King Charles spaniel was crossbred with the Pug, producing the modern King Charles spaniel. 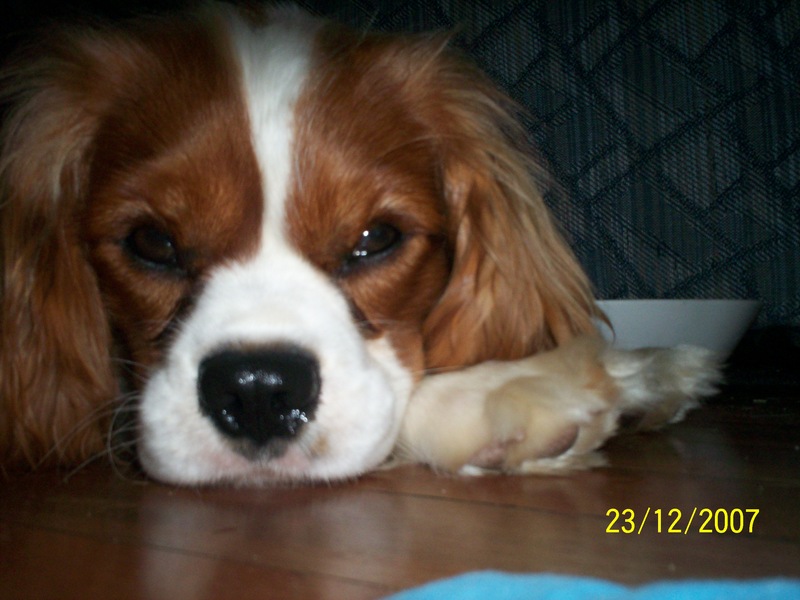 The original King Charles spaniel had a shorter nose and smaller eyes than the modern King Charles spaniel. Some people were unhappy with the look of the modern King Charles spaniel and longed for a return to the original King Charles spaniel as shown in the paintings by Sir Edwin Landseer. 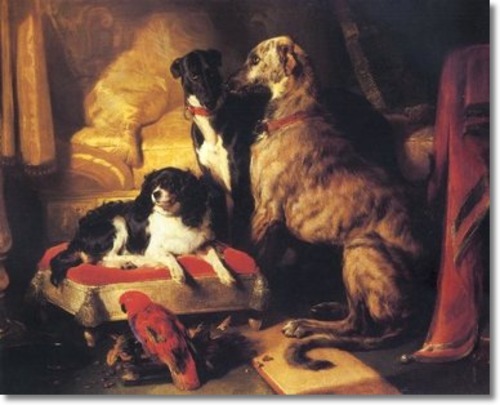 An example is his 1837 ‘Her Majesty’s Favourite Pets’ which shows a King Charles spaniel, a Deerhound and a Greyhound. In the 1920s, Roswell Eldridge, an American, offered a Crufts Show prize to any breeder who could come up with a dog that was “of the old fashioned type”. This spurred a movement to "recreate" the original King Charles spaniel by crossing modern King Charles spaniels with other dogs. The one thing they didn't ‘restore’ on were the smaller eyes of the original King Charles spaniel, the Pug's eyes remained on the modern King Charles Cavalier spaniel. My dog Oscar, although ‘restored’ to close to how he looked during the time of the Stuart monarchs, wants to go back to a time when there was a republican spirit in the land and has asked to be referred to from now on as a Cromwell ‘Roundhead’ spaniel rather than the royalist term King Charles ‘Cavalier’.